Institute of Medicine says the wide-ranging symptoms affecting 25% of Gulf War veterans cannot be lumped together. 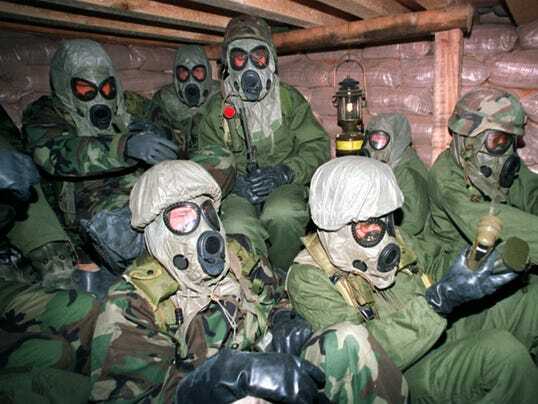 WASHINGTON — Gulf War veterans have such a wide array of symptoms and exposures that researchers and clinicians should not apply one definition to everyone, and should instead "select one based on their needs," according to a report from the Institute of Medicine released Wednesday. The Department of Veterans Affairs should also continue to call the string of symptoms "Gulf War illness," rather than chronic multi-symptom illness as proposed, because chronic multi-symptom illness (CMI) "is not specific to the population and its unique experience," the report finds. "The wide variation in symptoms has complicated efforts to determine whether a distinctive illness exists, as many symptoms of CMI overlap with those of other diseases and conditions, such as fibromyalgia and chronic fatigue syndrome," the committee found. But advocates for those suffering from Gulf War illness say the latest report ignores earlier research and reflects the VA's bias against coming to terms with the illness 23 years after the 1991 end of the Gulf War. "The conclusions of the report show that it was a waste of money," said Jim Binns, chair of the Research Advisory Committee on Gulf War Veterans' Illnesses. "The committee never had the expertise or the process to do a case definition. It's good they didn't do one." Binns called the bulk of the report "a slanted view of Gulf War research totally inconsistent with the science of the past decade." He cited a previous report from the Institute of Medicine (IOM) itself, as well as from his committee. Binns said the IOM's charge from the VA did not "provide for the rigorous data analysis and development of new data nor for the use of a panel of experts in the illness itself that are universally recognized as the keys to developing a case definition for an illness." The IOM looked at no animal studies, as the VA had removed them from the parameters of the study, Binns said. The IOM did find that fatigue, pain and neurocognitive issues had been reported in all of the studies that they reviewed. About one-fourth of the war's 700,000 veteransdeveloped symptoms that include chronic headaches, widespread pain, memory and concentration problems, persistent fatigue, gastrointestinal problems, skin abnormalities and mood disturbances. Gulf War veterans had feared the multi-symptom label would cause them to be lumped in with veterans of other wars who have returned with perplexing symptoms. But recent research, which went unreviewed by the committee because VA removed it from the committee's charge, has shown with MRIs that some Gulf War veterans have damage to the brain that could explain their symptoms. Other recent studies have shown damage to the autonomic nervous system. IOM researchers did not look at the possibility of environmental toxins, such as to sarin gas, anti-nerve-agent pills, or insect repellent, which some scientists believe hold the key to the disease. "Since the conflict in the Persian Gulf from 1990 to 1991, Gulf War veterans have experienced various unexplained symptoms that many associate with their service, but no specific exposure has been definitively associated with symptoms," the committee found. They also found no "no clinically validated tests or measures for diagnosing CMI and was unable to develop a new consensus definition of CMI given the lack of uniform symptoms, the variety of symptoms, and the long onset and duration." "CMI is an important cause of disability among Gulf War veterans," said Kenneth Shine, chair of the committee and special adviser to the chancellor at the University of Texas System. "The diversity and intensity of exposures and experiences, as well as the breadth and extent of symptoms, warrant workable definitions of the illness and nomenclature so the VA can advance research and administer effective treatments." Its report follows a year of animosity between the VA and the Research Advisory Committee on Gulf War Veterans' Illnesses, an independent body charged with overseeing the VA's Gulf War illness research. In the past year, the VA has replaced all but one of the board members, ended Binns' tenure as the board's chairman, removed the board's charge to review the effectiveness of the VA, and pushed research that looks at stress as a cause, rather than environmental factors. Last week, the VA told the board they must have the VA's written approval before releasing any reports. Soon after, they removed the board chairman's research report from a letter he wrote to VA Secretary Eric Shinseki. Aides to members of the House Veterans Affairs Committee said they plan to introduce legislation asking that the board regain its autonomy. The VA released a statement saying they appreciate the board's "valuable advice" and that it does not support the idea that Gulf War illness is the result of "post-traumatic stress disorder or other mental health issues that arose as a result of being deployed."